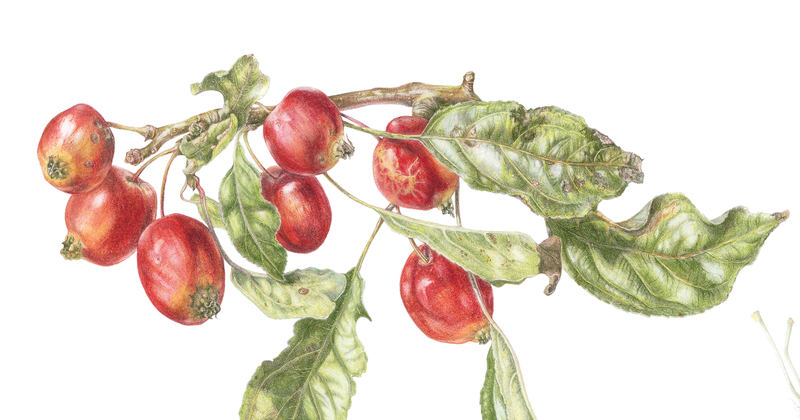 As a botanical artist I would much prefer to paint or draw, than anything else. But my husband reminded me that in whatever you choose to do, there are always some aspects of it you would prefer not to spend too much time on. I enjoyed getting all the information together for the six crabapple pictures in preparation for the RHS exhibition; I enjoyed the sketching, the planning, the study and drawing using a microscope and then getting down to the actual painting. But, I haven’t enjoyed the last couple of weeks quite so much. I feel as though I am stuck behind the computer with no way to turn. The colour matching of the pictures is now completely finished and I am satisfied with the results. What am I doing now? I am going through all the information that I have on the crabapples – individually and generically. I realise that in some areas I might need slightly more information as some aspects of what I have found out can be confusing. I need to put it into a simple format so that people can cast their eyes over it quickly and learn something new. I have started writing a bit about the crabapples in general. All that I have gleaned is interesting, but hopefully people will want to spend more time on the artwork than the writing. I suppose this means me spending ages on this to sift out unnecessary stuff. A week from now and I will know how I have done. I have asked before if you will either keep your fingers crossed for me or, preferably pray. I just hope that I have enough time to get all that I want to do – done. Now a glimpse of the ‘John Downey’ crabapples. Everything crossed for you Gaynor, love that you have blogged the journey – especially helpful for those who can’t make it there. Hope you post lots of pics and let us know how it all goes. Your work looks beautiful and while botanical art is so much more than the painting, I am sure when you are standing there you will be so proud of all that you put into it. All worth it! Hei Vickie, Thank you so much for your kind words. It is a very supportive message and at the moment I am very much in need of such. I still have to get the rest right though and there is always something that needs attention or adjustment. I will definitely let everyone know how it goes, even if I don’t win a medal!